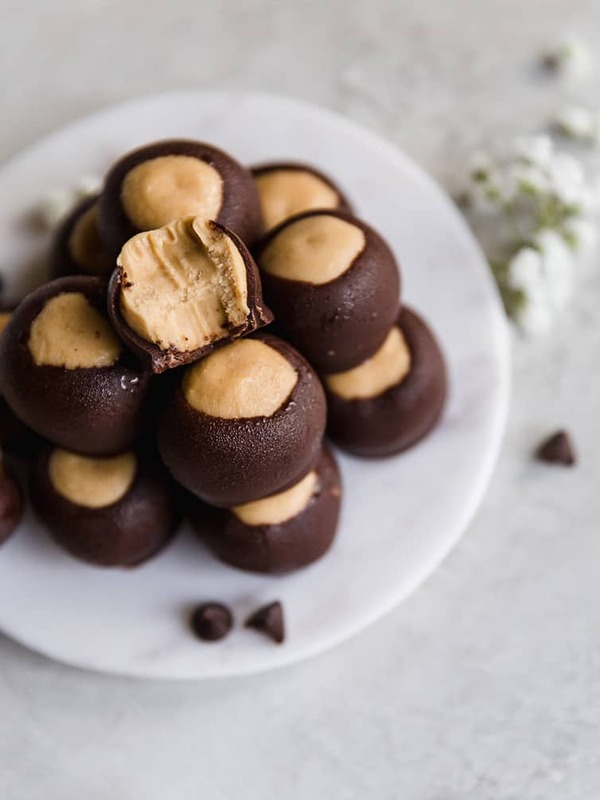 This classic Buckeyes Recipe is a family favorite; peanut butter balls dipped in chocolate only require a few ingredients and are a holiday staple. No Christmas cookie tray is complete unless it is overflowing with peanut butter buckeyes! 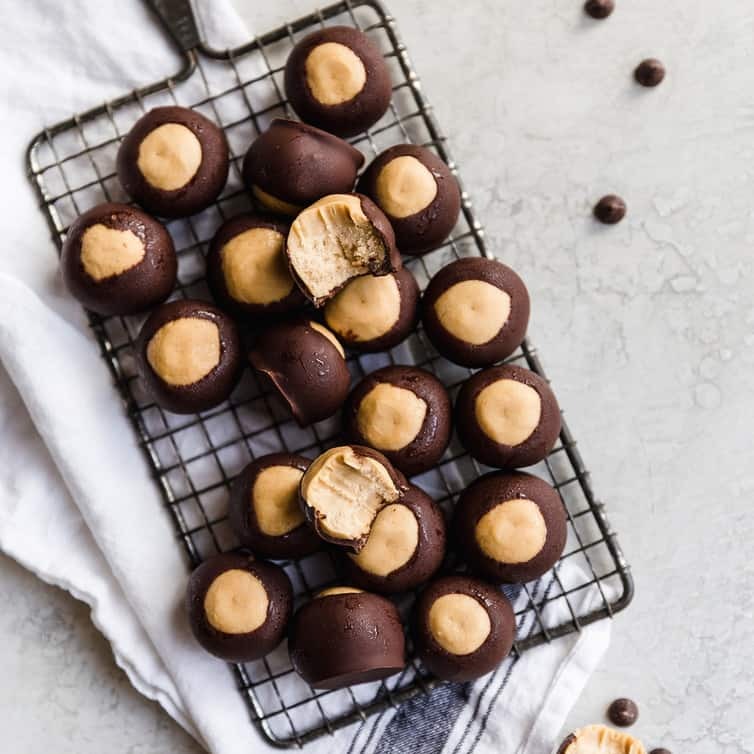 I absolutely love Christmas baking, and for my entire life my very favorite Christmas recipes involve the combination of chocolate and peanut butter, namely peanut butter blossoms and these peanut butter buckeyes. I’ve adored them ever since I was a kid; how could you not love something that is basically a homemade version of Reese’s peanut butter cups? 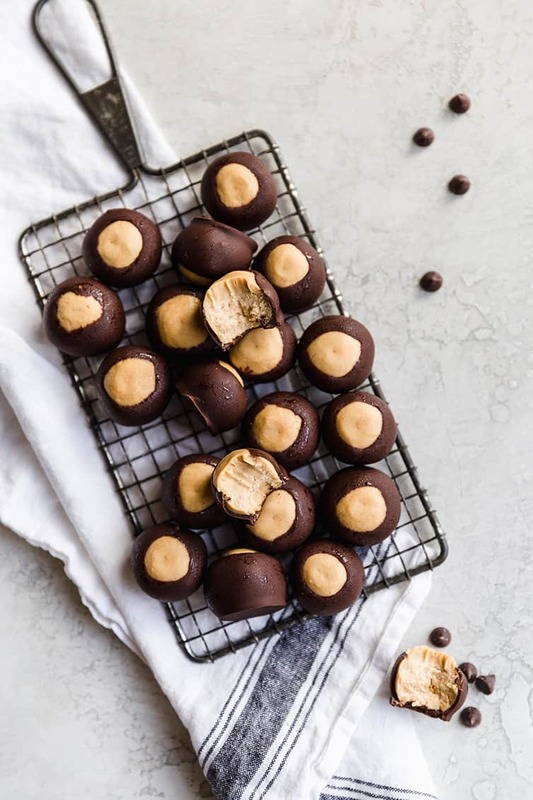 These sweet peanut butter balls dipped in chocolate are so easy to make and the recipe yields a TON, the combination of which makes them absolutely perfect for holiday baking. I have been making this buckeyes recipe for as long as I can remember; it comes from my dad’s cousin, and it has been gracing our holiday dessert trays since I was a baby. 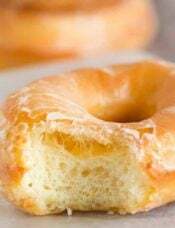 The recipe is super simple, only requires a handful of ingredients, and you do not need any special equipment. Here’s what you do! First, use a wooden spoon to stir together softened butter, peanut butter, salt, vanilla extract, and powdered sugar. You can bust out a stand or hand mixer if you want, but it’s just as easily accomplished with a plain ‘ol wooden spoon. This filling tastes so much like a legit peanut butter cup that I could just eat it with a spoon. SO GOOD. Using a tablespoon or small cookie scoop, portion out the peanut butter filling, and roll them into balls. Once you’re done, stick a toothpick into the center of each one and pop them into the freezer until they’re nice and firm, about 30 minutes. You want them to be able to withstand being dipped into warm melted chocolate, and not start to fall apart. This amount of time does the trick! Next, you’ll melt together chocolate chips and vegetable shortening, then dip the peanut butter balls so just a small circle at the top is still visible. The shortening helps to thin the chocolate and keep it from clumping up when melted, and I use it anytime I am coating something in chocolate (if you prefer not to use shortening, check out some alternatives in the recipe notes section below). Finally, pop these babies into the refrigerator to make sure the chocolate is totally set (a couple of hours), then eat to your heart’s content! Some tips for making the best buckeyes, ever! Do not use natural peanut butter for these, it is much too oily. You want to reach for a traditional jar of peanut butter such as Jif, Skippy, or your favorite brand. You can use salted butter and omit the salt, if you’d prefer. While the recipe calls for chocolate chips, you can also use the same amount of bar chocolate, finely chopped. Feel free to substitute dark chocolate or milk chocolate if you’d like. I spoke above about the benefits of using vegetable shortening, but if you prefer not to use shortening, you can substitute coconut oil (use refined so the flavor is neutral and you don’t get coconut flavor in your buckeyes!). 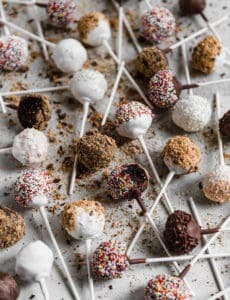 You could also substitute candy melts or something like CandiQuik for both the chocolate and shortening (though not nearly as delicious as real chocolate!). Follow the directions on the packaging for melting instructions. Make sure your buckeyes stay fresh for as long as possible! The buckeyes should be stored in an airtight container in the refrigerator to keep them nice and fresh. Stored in this way, they will keep for about 1 month (although good luck keeping them that long without eating them all, ha!). You can also freeze buckeyes in an airtight container or freezer ziploc bag for up to 3 months. So there you have it! 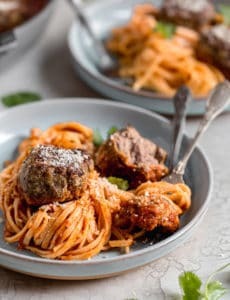 One of my oldest, most-loved Christmas recipes, and it could not be simpler to make or a bigger hit wherever you take them. Does your family make these? Is the recipe similar, or do you put a spin on them, like adding Rice Krispies? I’ve heard about that and am intrigued! This classic Buckeyes Recipe is a family favorite! 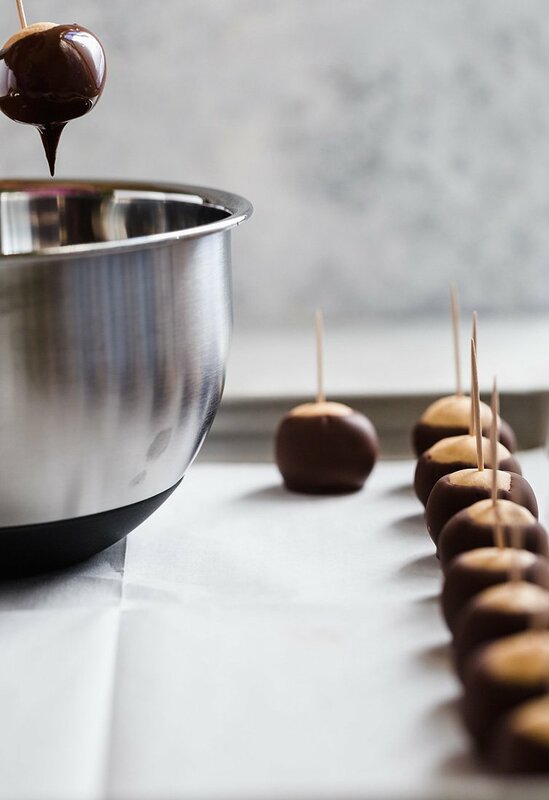 Peanut butter balls dipped in chocolate only require a few ingredients and are a holiday staple. Line cookie sheet with wax or parchment paper; set aside. In a large bowl, stir together the peanut butter, softened butter, vanilla extract, and salt with a wooden spoon. 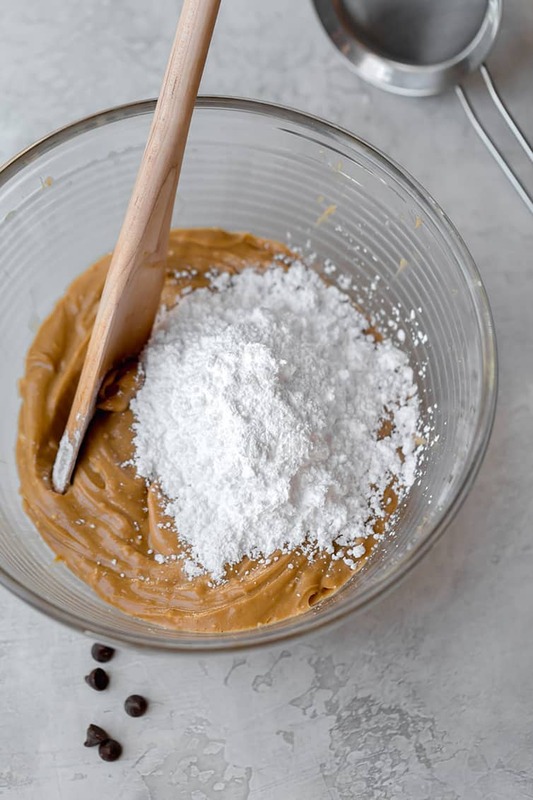 Add the powdered sugar a little bit at a time, stirring it into the peanut butter mixture until it is completely incorporated. Roll the peanut butter mixture into 1-inch balls. Set them on the prepared cookie sheet and insert a toothpick into the top of each ball. Chill in freezer until hard, approximately 30 minutes. In a heatproof medium bowl, combine the chocolate chips and shortening. Place the bowl over a small saucepan with 1 inch of water placed over low heat. Stir occasionally, until the chocolate is completely melted and smooth. Keep the bowl over the saucepan of barely simmering water. 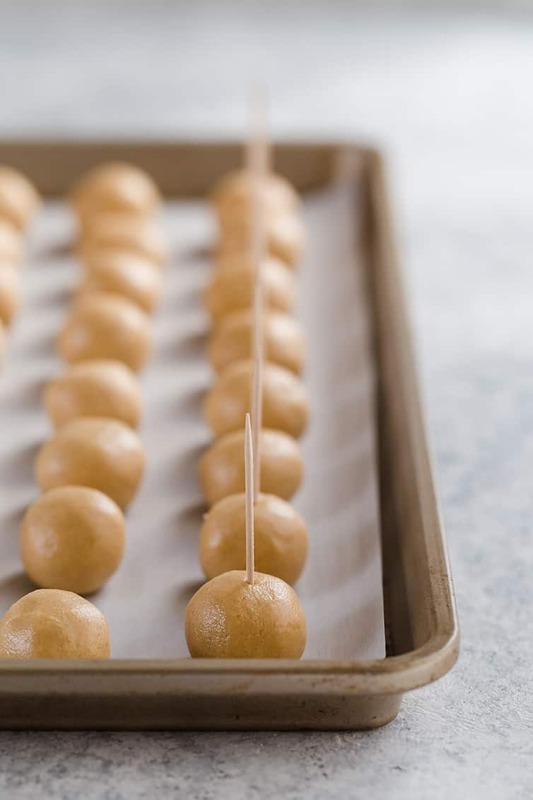 Using the toothpick as a "handle", dip the peanut butter balls into the chocolate, leaving a small circle exposed on the top of each ball. Place the balls back on the cookie sheet and refrigerate until the chocolate is set, approximately 2 hours. 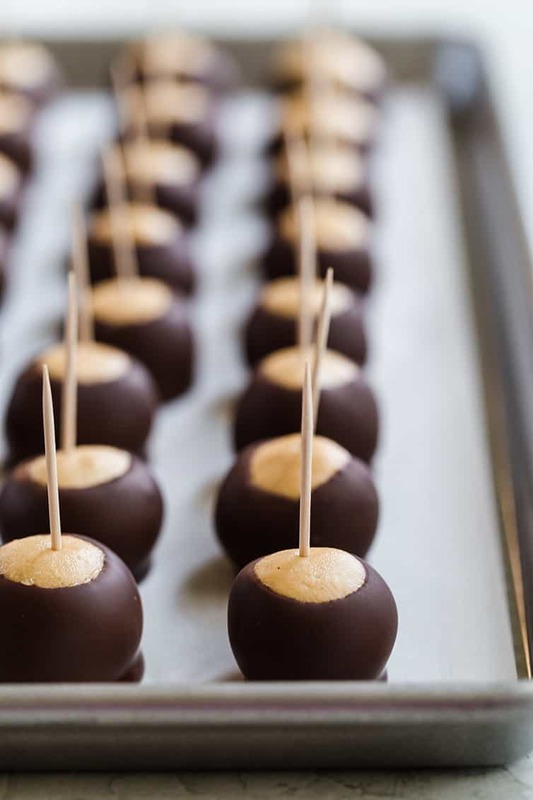 Once the buckeyes are set, remove the toothpicks and if you'd like, you can use your finger to smudge the peanut butter dough together on the top of the buckeye to cover the hole where the toothpicks were. Store the buckeyes in an airtight container with wax paper between layers in the refrigerator for up to 1 month. You can use salted butter and omit the salt, if you'd prefer. While the recipe calls for chocolate chips, you can also use the same amount of bar chocolate, finely chopped. Feel free to substitute dark chocolate or milk chocolate if you'd like. I spoke above about the benefits of using vegetable shortening, but if you prefer not to use shortening, you can substitute coconut oil (use refined so the flavor is neutral and you don't get coconut flavor in your buckeyes!). 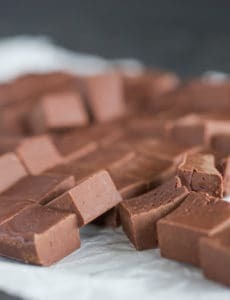 You could also substitute candy melts or something like CandiQuik for both the chocolate and shortening (though not nearly as delicious as real chocolate!). Follow the directions on the packaging for melting instructions. Buckeyes can be frozen for up to 3 months in an airtight container or freezer ziploc bag. Update Notes: This recipe was originally published in December 2007. Updated in December 2014 with new photos, and refreshed in December 2018 with more new photos, a video, and recipe tips. My grandma Jessie used to make these every Christmas. My mouth would start to water for them around November! I lost her recipe for them years ago, and was so excited when I saw your recipe!😊😁😃 Thanks so very much! Ok to use margarine in place of butter? Possibly already answered this in comments, apologize if so, i did not see it when I quickly scanned over comments. Thank you! I know it will seem like sacrilege but I made a teeny change to your recipe and people (who have had Buckeyes many times before) are losing their minds! They keep asking me what the secret ingredient is and I won’t tell them but I’ll confess it to you…. I added scant 1/2 tsp maple extract and 1/4 cup brown sugar and one extra pinch of salt. It adds a molassesy, caramelly undertone that is subtle but definitely adds a nuance to this already amazing treat. The extra salt helps balance the extra sugar. Why do buckeye recipes always specify creamy peanut butter? I’ve made them with crunchy peanut butter many times and love them that way. These are just plain perfect! Better than any peanut butter cup on the market! Soft and creamy and peanut buttery and chocolatey! YUM! 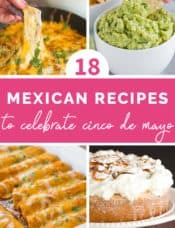 Thank you for yet another amazing recipe! These have been a Christmastime favorite for me since I was a young child when my “Grandma” Downey (not blood family, but as good as!) would make them. She added lightly crushed Rice Krispies to hers, but the last several years I’ve been making them with puffed quinoa. 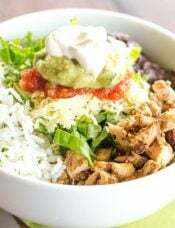 The puffed quinoa adds a similar texture, but it’s smaller and easier to manage, plus it has the bonus of being gluten-free for my friends who need that. I love your blog and recipes, and not even because I was raised in my beloved Pittsburgh, but now live in Florida. I was challenged to a buckeye bakeoff this Christmas by my mother-in-law and daughter. My question is how to get the holes from the toothpicks to go away? I am a firm believer that buckeyes should not have the toothpick hole shown in the finished product! Thank you! Have a very blessed Christmas! Hi Lynn, Thank you for the kind words! As for covering up those toothpick holes, I just use my finger to smudge it closed :) Good luck in your bakeoff! The recipe I’ve used for more than 30 years does call for the addition of Rice Krispies. Last year as I started to shape the peanut butter balls I realized that I had neglected to add the cereal. Ah well, I thought no one will care, it’s still peanut butter and chocolate. Boy was I wrong! Everyone was so disappointed that they weren’t the “traditional” buckeyes that I’d made for years. You better believe that the Rice Krispies will not be forgotten this year. It looks so yum! 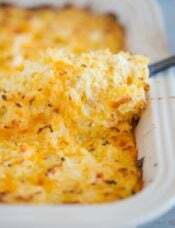 This recipe will definitely be on my Christmas table, thank you for sharing! Being an Ohioan, we had these every Christmas. They are my favorites. So smooth & creamy. Better than Reece’s cups. So easy to make too. Really. Just have to be a little patient and let the PB balls get hard do you can dip them better. Hi Ben, A standard measuring cup. 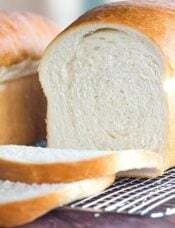 I will be updating the recipe with weight measurements, as that might help. Yes, vegetable oil should work! Not sure why but I had to use a lot more powdered sugar to be able to form the peanut butter balls, other than that they turned out grate. I used coconut oil instead of vegetable shortening. Do you have any recommendations for sticky pb batter? This is the 2nd year in a row that my batter has come out sticky and difficult to roll. I’ve added a little more powdered sugar, but I am trying to avoid super sweet buckeyes. The batter is currently sitting in the fridge to hopefully harden up a bit to help me roll them. Otherwise, I LOVE this recipe and use it every year. Hi Sharon, Hmmm I usually have the opposite problem and they tend to be too dry. Try adding some finely crushed graham cracker crumbs. I use those in my peanut butter bars and they add a little texture that might help yours firm up! Oh these are amazing, who isn’t a sucker for peanut butter and chocolate! I love buckeyes too!! I remember someone bringing them for birthday treat in 1st grade (before the days of no-peanut rules – haha!) and falling in love!! My husband and I firmly believe that peanut butter and chocolate are the most perfectly perfect combo there is!! Trader Joe’s Dark Chocolate PB cups are basically in our house at all times:) Lat year, I tried a recipe that year that added nutritional yeast to the peanut butter portion. Have you tried that? It does make it reminiscent of the traditional Reese’s cups, but I can’t get past the funkiness smell/taste it adds. 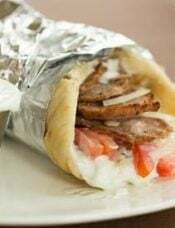 Your version looks delicious! Hi Maria, I’ve never tried nutritional yeast (never heard of it in buckeyes until now!). I’ve had luck adding some finely crushed graham cracker crumbs for more texture.